Welcome to the North Alabama Hiking Home Page! This website is for anyone interested in hiking some of the great trails that North Alabama and Southern Tennessee has to offer! Alabama hiking trails offer hikers a lot of diversity. Within a 50 mile radius of Lauderdale County you have hiking trails that take you along side the beautiful Tennessee River, alongside creeks and branches, and in some areas you can hike in the mountains and get breath taking views. I encourage you all to take some time and visit these trails and experience what Alabama has to offer. On this website you will find information on the trails I have hiked so far. I will be adding more trails later when I am able to get a chance to visit them. I have brief descriptions on how I hiked each of the trails along with photos and other basic information. You will also find directions to each trail on the "directions to trail" link. This link has embedded google map locations of that specific trail head. I hope you will get a chance to visit some of the trails listed here on the site, or some of the other hiking trails in Alabama. In the mean time, I hope you enjoy viewing the photos here on the site as well. 1/5/2019. I located Shangri La Falls and added the GPS coordinates for it. For more info click here: Bankhead/Sipsey Page . 1/1/2019. For my first hike of 2019 I went down to Bankhead National Forest/Sipsey Wilderness and located Eagle Creek Falls and Deer Skull Falls. I added the GPS coordinates of each. For info on that click here: Bankhead/Sipsey Page. 12/16/2018. Beginning in January 2019 the trail head on Cecil Ashburn DR will no longer be accessible due to road construction. For more info visit the Blevins Gap page on the Landtrust of North Alabama's website by clicking here: Landtrust-Blevins Gap Page. 11/22/18. Since winter is getting closer I thought I'd compile a list of the top 5 winter hikes in the North Alabama, Southern Tennessee area. #1. Bankhead National Forest/Sipsey Wilderness. Joe Wheeler State Park, located in Rogersville, Alabama, is a great place to hike in the winter. One of the main reasons is the high deer population. Although you can usually see deer year around here, the winter time is usually even better. Also, with the leaves cleared off of the trees you will get better views of Wheeler Lake. Winter time at JWSP is also a great time to visit if you're a bird watcher. For more information click here: Joe Wheeler State Park Page. Cane Creek Nature Preserve is located in Tuscumbia, Alabama and offers a similar experience that the Bankhead National Forest/Sipsey Wilderness area offers, only it's a little easier and safer. CCNP is privately owned by Jim and Fay Lacefield, but is open to the public. There are several small waterfalls on the preserve and the winter season is when they are at their best. The trails are well marked and even have out houses along the way for your convenience. 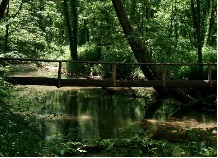 For more information click here: Cane Creek Nature Preserve Page . Stillhouse Hollow Falls is located in Summertown, Tennessee. It's a nice short hike to a fairly large waterfall. Winter is a good time to visit here due to better water flow. Another reason it's a good hike to do during the winter is because it does not take long to get to it. It's only about a one mile round trip hike if you just hike to the falls. You can hike along the ridge if you want to and with the leaves being off of the trees you'll get a better view. For more information click here: Stillhouse Hollow Falls Page. 6/16/18. I visited Mousetail Landing State Park and the TVA"s Ladys' Bluff trail in Linden, Tennessee. MLSP is a nice park especially for day use. The Lady's Bluff trail is a great short hike that will take you up onto a scenic bluff overlooking the Tennessee River. For more click here: Mousetail Landing State Park page. The Land Trust of North Alabama has officially opened the Chapman Mountain Nature Preserve in Huntsville, Alabama. The preserve currently has about three miles of hiking trails. More trails will be added to Chapman Mountain in the future. Chapman Mountain Preserve Page. 3/4/18. Updated. I returned to Sipsey and added some GPS coordinates for Wolfpen Falls, Holmes Chapel Falls, Parker Falls, Mize Mill Falls, Turkeyfoot Falls, Caney Creek Falls, and Kinlock Falls onto the Bankhead/Sipsey page. To see the added GPS coordinates click here: Bankhead/Sipsey Page. As a new added feature to the site I plan on adding GPS Coordinates to certain locations on trails. I will only have a few to start with since I just purchased a new GPS unit. I hope this will make it easier for those of you who hike with a hand held GPS to find certain locations. 9/12/17. I returned to South Cumberland State Park and hiked from the Collins West trail head to Suter and Horse Pond Falls. I have added some information and pictures. Click here to view the page: South Cumberland State Park Page. 3/7/2017. If you have noticed a few sloughs along the Tennessee River on Wheeler Lake looking a bit cleaner it's because of the efforts from a small volunteer group from the area. Clean up efforts began last year around this time and have kicked back up this year cleaning around Joe Wheeler State Park and other areas alongside Wheeler Lake. The groups effort,working one day per week on the weekend, has made a difference and the results are very noticeable. You can now follow NAH on Instagram!